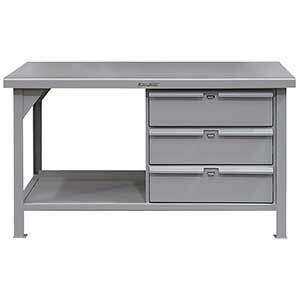 This 72"W x 36"D x 34"H shop table with 3 drawers provides extra storage for small parts and valuables. Drawers are lockable and offer secure storage when off duty. Table capacity is 10,000 lbs. and the lower shelf capacity is 2,650 lbs (uniformly distributed). Color is Dark Gray.